This deodorant by EnergyBalance™ is natural, fragrance-free, hypoallergenic and does not contain aluminum chloride. The deodorant stick is made of potassium crystal, slows the production of bacteria and prevents build-up of unpleasant odors. It lets the skin breath and perspire naturally. 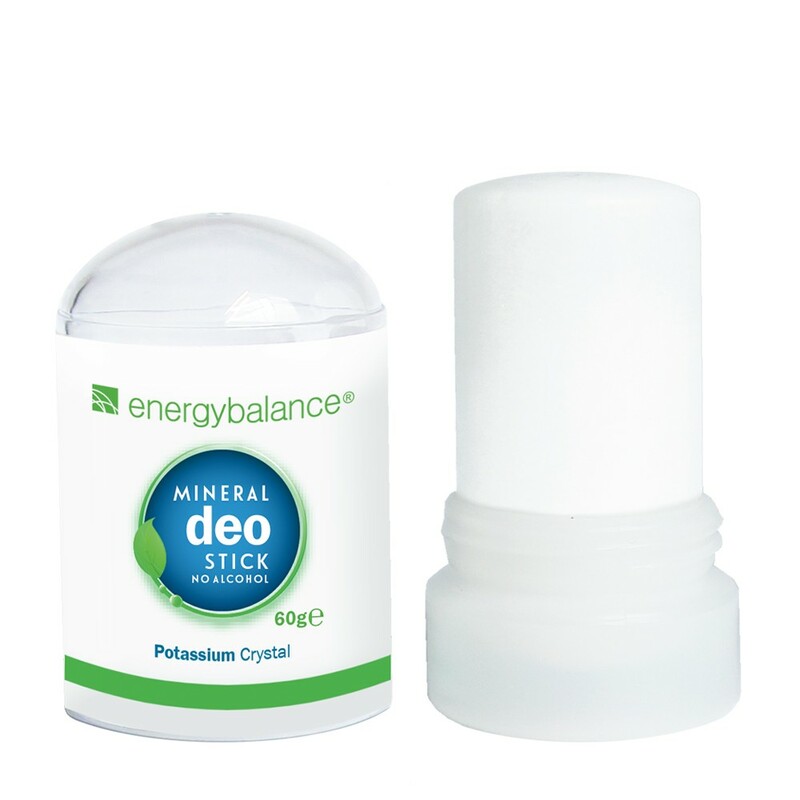 The deodorant by EnergyBalance™ is perfect for all skin types, even very sensitive skin. It effectively protects against unpleasant odors throughout the course of the day and is fragrance-free, which means you can wear it with any perfume. Contents: 60g. EnergyBalance™ deodorant without aluminum chloride effectively protects against unpleasant odors throughout the day. Because it is fragrance-free, you can wear it with any perfume. And it won't stain your clothes or leave residue on your skin. In addition to providing you with effective deodorant protection, it also tones and tightens the skin. When an antiperspirant claims to be “aluminum-free,” they are saying it does not contain aluminum chlorohydrate, aluminum chloride, aluminum hydroxybromide or aluminum zirconium—all forms of aluminum commonly used in antiperspirants and deodorants. To stop the flow of sweat to your skin’s surface, the aluminum plugs sweat ducts in the top layer of your skin stopping the the natural flow of sweat to your skin’s surface. This aluminum can also be absorbed into your body where it can then build up as part of your body burden. Alzheimer’s disease and cancer are two illnesses known to be associated with aluminum exposure. The aluminum in crystal deodorant stones is a different type of aluminum, called alum. The most common form is potassium alum, also known as potassium aluminum sulfate. Potassium alum (and other alums) is a natural mineral salt made up of molecules that are too large to be absorbed by your skin. They form a protective layer on your skin that inhibits the growth of odour-causing bacteria. Moisten the tip of the stick and apply gently. Remember to use some tissue paper to dry the stick off after use. 100% natural, plant-based, hypoallergenic, fragrance-free, no animal testing, no aluminum chloride.